Ha, I might be well on my way to becoming the queen of garland making here on the internet! What can I say? 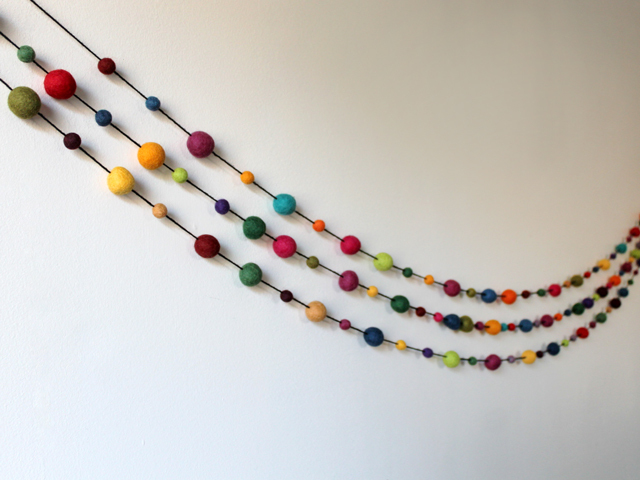 I'm very attracted to the way a colourful string of things looks, and there's a wall in our home that just looks too bare if a garland isn't hanging there. 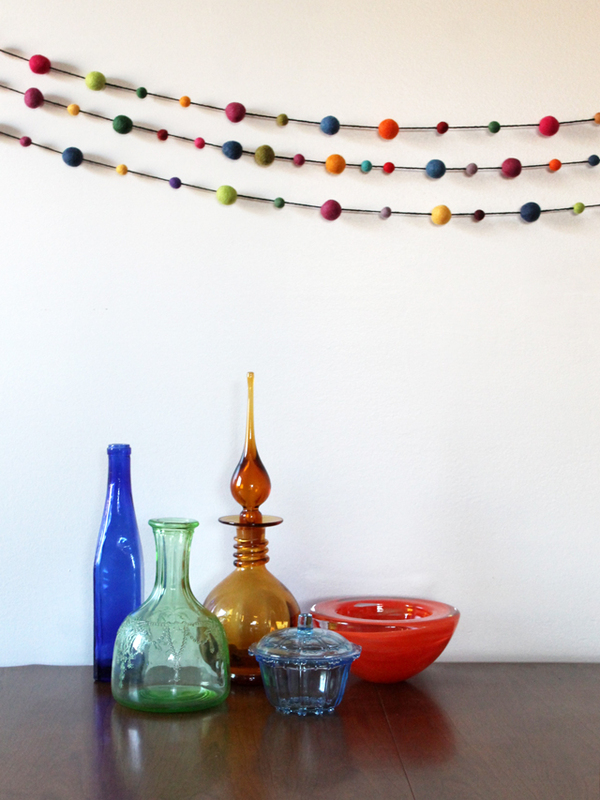 Of course, I could put some permanent artwork there, but then, where would I hang my garlands? This one came about after a quick trip to Michaels for a crochet hook. As I was bent over checking the various sizes, a bag of apparent perfection whispered out to me, asking if I'd noticed the absolutely gorgeous variety of colours it beheld. I responded, "Yes, I see you, and you are very beautiful, but you're in the "needle felting" section, and, while I have a Pinterest board brimming with images of small adorable felted animals, needle felting is something I don't know how to do. And, you're 22 dollars." I left the store with my crochet hook. 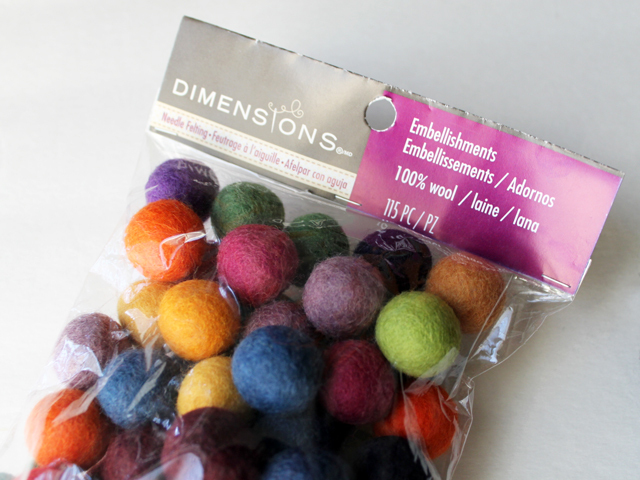 A few days later, I saw that Michaels was offering 55% off one item, and, so, I came to have a bag of gorgeous pure wool felted balls. Then, on Wednesday evening, with my essential oil diffuser gently scenting the living room with the aroma of cinnamon and cloves, and with a glass of red wine at my side, I stung them together on a piece of yarn. It was one of the most comforting crafting experiences ever, and easy enough for most anyone to do. 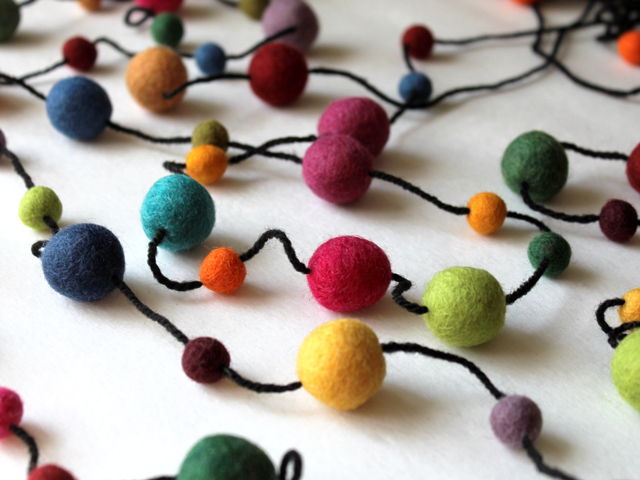 Poking that darning needle through those balls was oh so satisfying and the texture was delightful to the touch. I had three garlands finished in 45 minutes, making this a perfect relaxing time-out from a busy day, which yielded something to be enjoyed for years. Have I succeeded in encouraging you to give it a go yet? If you live in downtown Toronto, there's a store at Richmond and John. These balls are found on the second floor at the end of the row, near the yarn and just past the jewellery making things. As far as I know they only come in this colour-way. 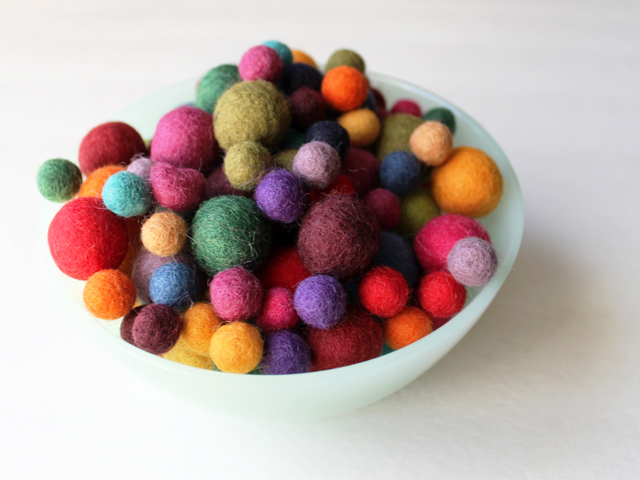 The pure wool felted balls come from Kathmandu, Nepal and each bag contains 115 pieces, in two sizes. 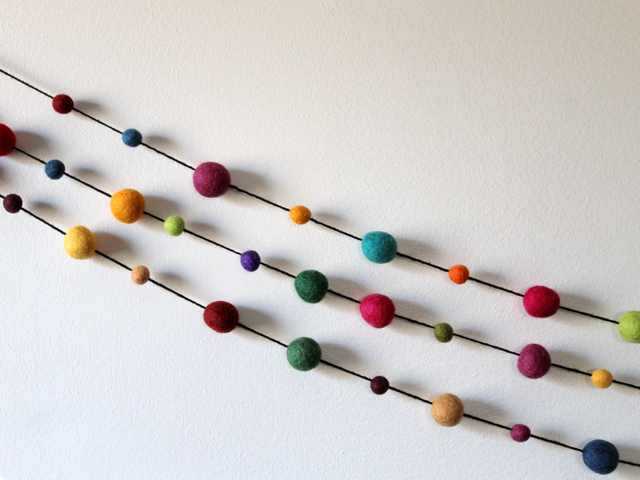 As mentioned, I've never tried "needle felting" but these are called "embellishments" for that craft. I think you're supposed to use a special needle and connect and shape them together to make figures. I used all but the black ones to make three garlands, which are each 6 1/2 feet long, plus extra yarn at the ends to tie them. 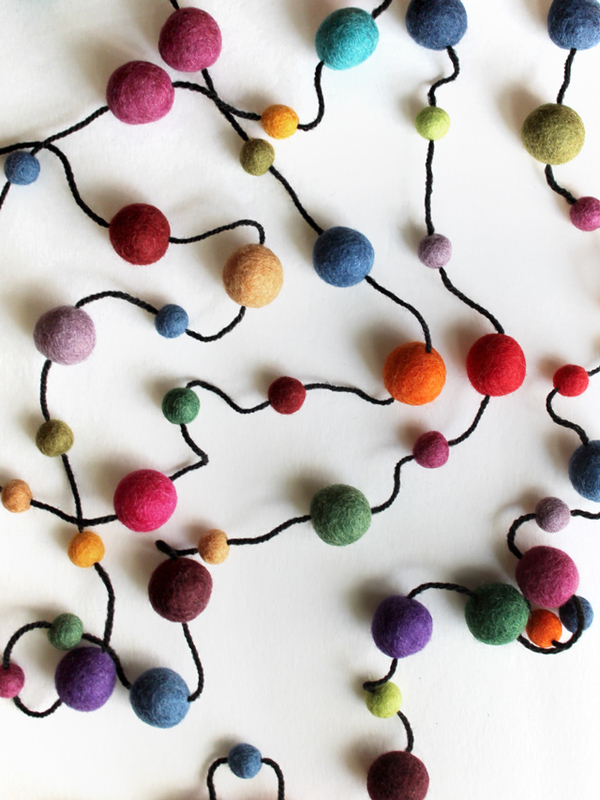 The balls can move along the yarn, but stay nicely in place once you're happy with the spacing. I chose to leave gaps between the balls however they could be stung together closely as well. 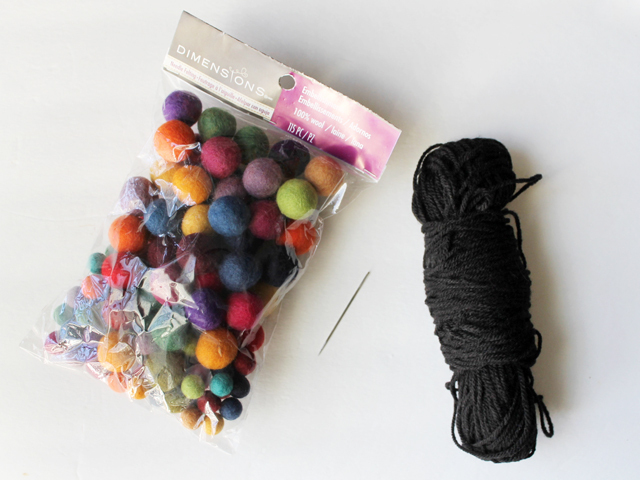 Supplies : A bag of felted wool balls, a piece of yarn and a darning needle. 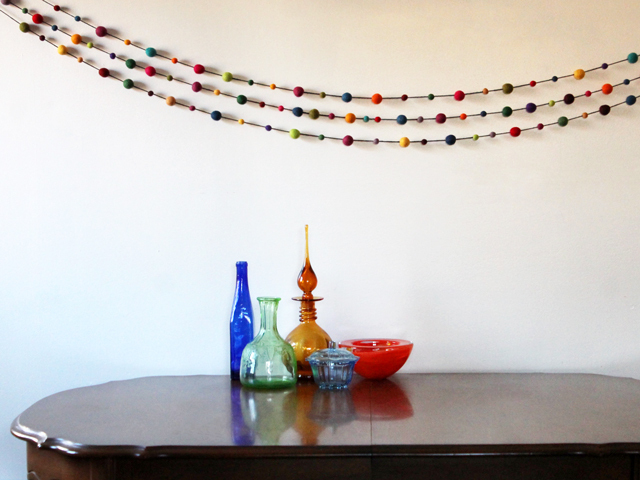 Cut a piece of yarn as long as you want your garland plus some extra length to allow it to drape nicely when hung, and also about 12 inches extra at each end, to hang it. My pieces of yarn were 110 inches long. 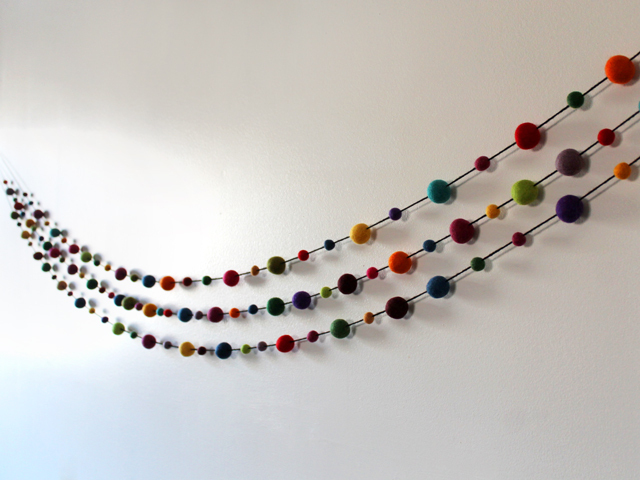 Thread the needle with the yarn and pass it through the centre of each wool ball. 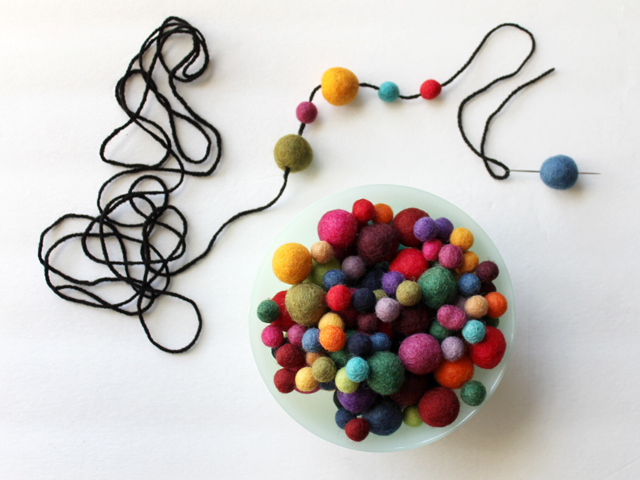 It's easiest to move the first balls to the centre of the piece of yarn and then work towards one end. 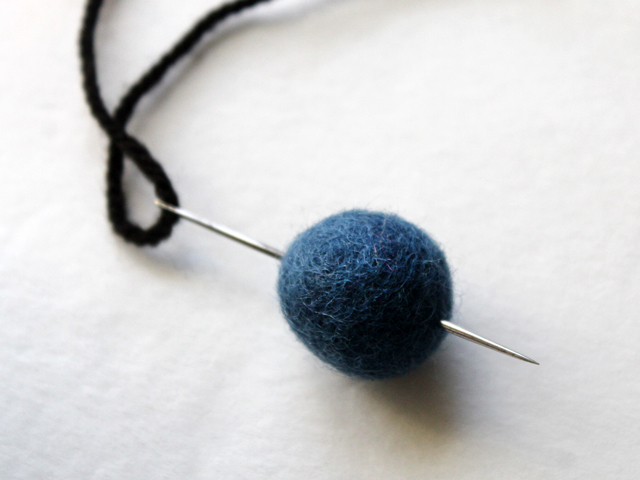 Then, remove the needle from that side and rethread with the other end, adding balls to the second half. 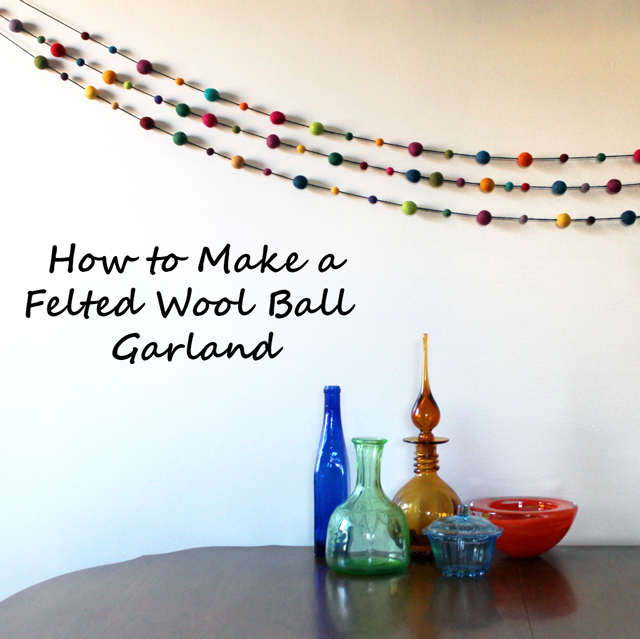 Leave the ends of the yarn free for hanging. Hang by tying a slip-knot loop and put that over a nail or hook in the wall. Thanks for reading. Wishing you a great weekend and Happy Thanksgiving to my American friends.